You’ve rented or bought your trap to catch your shy, lost dog. Now all you have to do is go out and throw it on the ground, right? And your dog will jump in, right? Sorry, wrong. Again preparation is the key and we’ll try to walk you through it step by step. Many people give up trying to trap their dog in frustration and it is generally because they haven’t taken the time to do it properly. Quietly unload your equipment and trap with only one or two helpers. Remember, your dog has been visiting this location to eat and he might be lying in the woods watching you right now! Keep your voices down, get the trap set up and then get out of there as quickly as possible. You don’t want to frighten him away. Choose your location based on what you learned in Part 12 of this series. Clear any debris from the ground. You may have to prune a few trees or remove any small plants that will poke up through the bottom of the trap. Securely lock the trap to a tree or solid object using your padlock and chain. 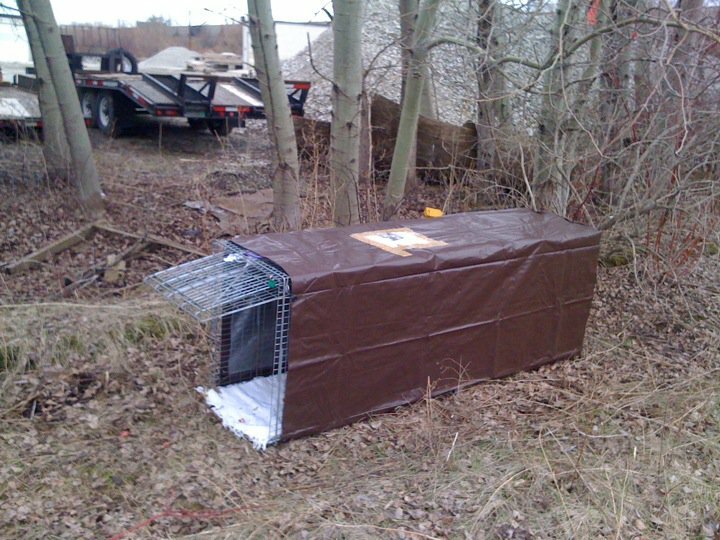 The number one reason that shelters have stopped lending out traps is because they get stolen and not returned. Prevent that from happening and help the next person who has lost their dog and needs a trap! Make sure that everybody that is helping you has a key to the padlock or knows the combination. In winter or inclement weather you will want to wrap the entire trap in a plastic tarp. This will provide your dog with shelter and prevent the bedding from getting wet. Leave both ends open so the dog can see through. Roll the trap in the tarp and use your electrical ties to secure it to the wire of the trap. You will have to punch small holes in the tarp with your scissors to push the electrical ties through. Get it really nice and tight. You don’t want the tarp to flap in the wind and scare your dog. Tape one of your dog’s flyers to the top so that anybody that stumbles across the trap knows what you are trying to do. In summer, you might want to leave the trap unwrapped, for better air flow. It can also depend on the nature of the dog also. Some dogs enjoy the feeling of a “den”. Some will feel claustrophobic and prefer to feel like they have an escape route. ALWAYS cover the entire floor of a trap. Lost dogs often have raw, sore, sensitive feet from travelling. They won’t want to walk on the wire floor. Make it easy and nice for them. Spread your hands and push down on the floor covering. If you can still feel the wire through the covering, so can your dog. You need to make it thicker. Make sure the floor covering fits well and doesn’t interfere with either the trip plate or the door. You might need to cut it with your scissors to fit. It shouldn’t hang out the front of the door. If your dog has been lost a really long time and is in a very feral mode, you may want to use dried leaves or straw instead of something that smells too “domestic”. Attach a white washcloth in the middle of the door of the trap using electrical ties. This will enable you to see from a distance if the trap has been tripped. Next, bungee the trap open. In the next installment of this series, you will see why. Sprinkle a few bits of hotdog around the front of the trap. Check your trail camera position to make sure that it will capture pictures of your feeding station and your trap. Ideally the two should be about twenty to thirty feet apart. Give the trap and the ground surrounding it a light coating of Pam butter flavored cooking spray. This acts as a scent blocker and is very important if you have people helping you that your dog does not know. You can also buy scent blockers at hunting supply stores but Pam works just as well, is less expensive and readily available. Spray the area that you have walked on and back out of the area – lightly spraying it also. Then get out of there! Your dog needs time to get accustomed to the look and smell of the trap. Don’t disturb him. Notice, we didn’t discuss baiting the trap? That’s because we’re not ready to do that yet. In the next article, you will see why. Click here to go to Part 13. Humane Trapping, Recovery Procedures, Shy Lost Dog Series, Shy Lost Dog Strategies, Trail Cameras tracking, trapping technique, traps. permalink.